This wasn't the original project I had intended on posting today - my desk is still not fully cleaned off from yesterdays projects - thus more bling on my project for today! This weeks Bloggers Challenge is Ornaments or Decorations for Christmas - good timing with Christmas right around the corner and it fits in with my TJ Blogstravaganza postings! If you'd like to play along - just leave a link her to your creation - or if uploading to SCS use keyword BC77. 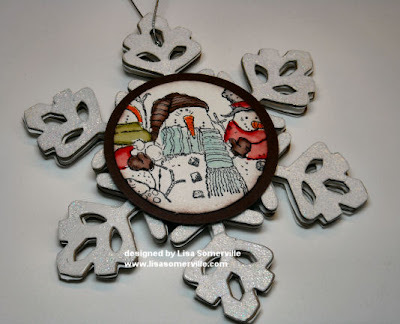 My ornament started out with some white card stock I cut using my Snowflake Die, Crafty Board and my Big Shot. I love the Crafty Board from WorldWin because it's pretty flexible yet think like chipboard. Because I was using 2 snowflake dies and a piece of Crafty Board, I couldn't adhere my paper to my Crafty Board before I cut - thus the need for my Scrappy Glue! 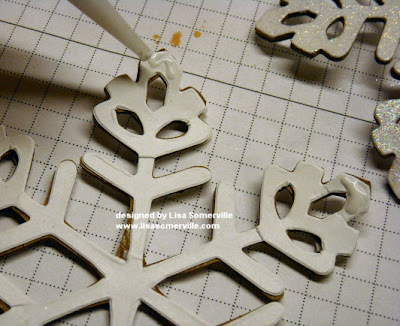 Cut 4 snowflakes from your white card stock, and 2 from the Crafty Board. Mix some Clear EP with some Dazzling Diamonds glitter in a disposable container. 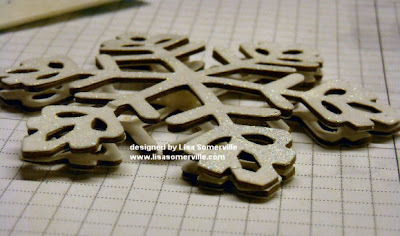 Smoosh your versamark pad onto 2 of the die cut snowflakes, pour on your Embossing/Diamond mixture, tap off and heat. By premixing the Diamonds into your Clear EP, you eliminate the step of adding the Heat & Stick Powder for adhering the glitter. 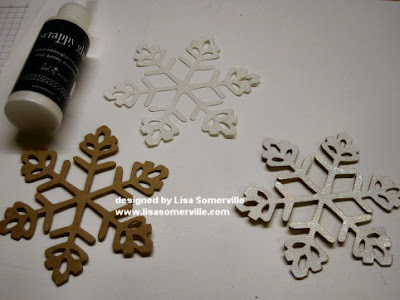 Adhere to 2 bling snowflakes to your Crafty Board using the Scrappy Glue, let dry. 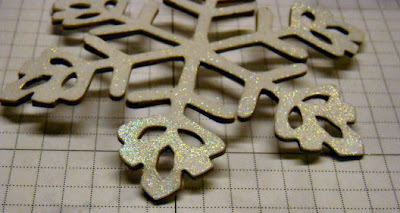 Flip snowflakes over, adhere the remaining snowflakes to the back of the Crafty Board snowflakes. Remember I mentioned the Crafty Board is flexible, slightly bend the points of your snowflake, this will help give it a 3D look when they are adhered together. Then using your Scrappy Glue - place the glue on the points of one of the white snowflakes, match the other snowflake to the one with the glue and hold the points securely. Note this glue dries super fast! Tie on cording - use as is, or add a stamped image if desired. 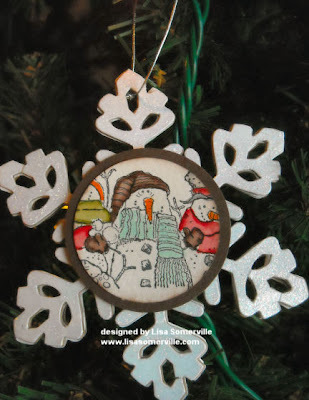 Here I stamped my snowmen from Holiday Lineup on watercolor paper, then colored them using the Marker Water Coloring Technique. I added some Shimmerz Angel Wings to the snowmen to bling them up a bit, sponged the edges, adhered to my Chocolate Chip circle, then to my finished snowflake. oh, too cute! I love that little snowman! really great job. Beautiful Lisa! Thanks for the tutorial too! Love the sparkle!!! OMGosh...isn't this the most adorable ornament. I just love this snowman stamp with such a fun expression on his face. Thanks for sharing your process with us! Gorgeous creation Lisa!! :) Love the tips!! TFS!! Adorable, Lisa! This is my Christmas gift, right? LOL! Very cute! Thanks for sharing the Crystal Effects/Glitter idea! That snowman is the cutest! Great ornament! Totally CUTE - Love the colors and the sparkle! So cute, love that snowflake! Very cool Lisa! Thanks for the directions too. Love this! !Thanks for the tutorial!That snowman is just the cutest!! So great, I love it. Thanks for the tutorial. Adorable! Love that snowflake die! Fantastic, Lisa! I love the framed snowman image at the center. Thanks for sharing the tutorial, too. LOVE IT! This really looks like it pops right off the tree. Thanks for the extra tips in the tutorial! This is beautiful, Lisa! Love the tutorial. I love these! I think I will let the kids make these this week with their pictures in the middle. Thanks for the tutorial! Very pretty and a great tutorial. I like how you added the snowmen scene.